This pedagogical tool is a way to reinvent one of the most crucial plot points of Harper Lee’s novel, To Kill a Mockingbird. We have created a mock interview with a few of the main characters, to focus on the development of character through dialogue, and to encourage students to think critically about the role of the justice system in the novel. Teacher Candidates: Sarah Cook, Jordan Legg, Jeremy Thackray and Michelle Walsh. The students will be instructed to just listen to the interview and gain a general understanding of what the interview is about, who is being interviews etc. The interview will be played one more time but this time the students are to jot down point form notes about specific ideas, language and cultural references. The class will then have a brief discussion about the interview. After the main ideas have been discussed the students will be divided into pairs and will be instructed to create three more interview questions and answers for the character of Tom Robinson. Once the students have finished creating their questions and answers they can assign roles and practice their script for their three questions will be presented to the class in an interview format. The basis for all effective teaching tools and strategies is a solid foundation in theory. When developing a pedagogical teaching tool, it is key to use that theoretical foundation to inform the choices made in the process. 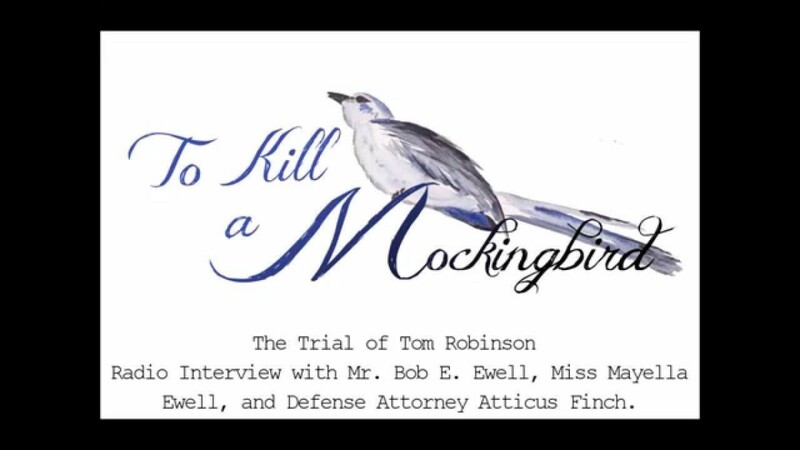 Our pedagogical tool, a radio show featuring interviews with some key characters from Harper Lee’s novel To Kill a Mockingbird, satisfies a multitude of traditional, and new literacies. We chose a novel that is viewed as a part of the English curriculum, and re-invented the main conflict through a radio show in order to engage students further with the plot and characters. It is a growing concern for educators that students are losing “book knowledge”, that “today’s students are so tuned into their [technology] they won’t know how to speak, write, or read anymore” (Vacca, Vacca & Mraz 44). It is through the immersion and understanding of today’s technology that we as educators become aware of how much more information our students are able to access with the assistance of technology. Statistics in Content Area Reading: Literacy and Learning Across the Curriculum show just how involved with “digital technologies” today’s adolescents are: “75 percent of teens have a cell phone, 93 percent use the Internet, 68 percent of online teens use instant messaging, and nearly 75 percent have created content for the Internet” (44). Instead of being worried about losing “book knowledge” and stepping away from traditional teaching styles, we as educators should be capitalizing on the technologies available to us and our students as learning tools. “Media literacy” is defined as “someone’s ability to access, analyze, evaluate, and produce communication and information in a variety of media modes, genres, and forms” (12). With the influx of new technology accessible every day, and the need for it to be integrated into the classroom, developing “media literacy” is essential for preparing students in today’s society. Our pedagogical tool uses quotes directly from Lee’s novel, To Kill a Mockingbird, as a way to scaffold student learning of the content in the novel. The format of the text changes from the traditional ink on paper to a non-print, aural form. Texts is defined as “sets of potential meanings and signifying practices”, which could be reading the actual novel itself (which is recommended before using our tool to ensure understanding), or the multimedia radio show parts of the novel has been transformed into (13). For the benefit of students, this pedagogical tool has been created, extracting excerpts from the trial of Tom Robinson and turning it into a more accessible news report. The questions posed by the news reporter help to frame the answers given to clarify student understandings of the novel’s plot. While the quotes are taken somewhat out of context, it shows the students how to think critically and analyze sources while being engaged by a mode of delivery more active than reading the novel. Further, the ease of access to the radio show is increased by the file being an MP3. This is a format that can be downloaded to all devices: iPods, MP3 Players, Smart Phones and laptops. With its wide array of delivery options, students are able to download the radio show just by having the proper link, and can then listen to the show when they wish. Our pedagogical tool is not limited to the classroom, and therefore does not limit students to the traditional way of reading and studying a timeless novel. Vacca, R., Vacca, J., & Mraz, M. (2014). Content Area Reading: Literacy and Learning Across the Curriculum (11th ed.). Upper Saddle River: Pearson Education.